VANK (Voluntary Agency Network of Korea) is a cyber diplomatic organization which started in 1999 when a young man exchanged an e-mail with a foreign friend. He was shocked that his foreign friend knew very little about Korea or possessed incorrect information about Korea. He started to dream that if one Korean had 5 foreign friends and was able to teach them correct information about Korea, one day, 6 billion friends around the world would have a holistic understanding of Korea. Thus Korea would be able to be a “friend” of the world, after creating close relationships with other countries. Now, there are 70,000 VANK members who have the same dream of becoming cyber diplomats to let the world know about Korea and carry the vision of ‘Korea, as being the hub of Asia and gateway to Northeast Asia; along with being a country which shares its dream, friendship and business with all people around the world.’ They spare no effort in realizing this vision by helping the world get to know Korea on the Internet as cyber diplomats. Since 2005, VANK youth members have been using cyber diplomatic programs in their club activities in schools to expand their scope of activity. At present, there are about 400 VANK clubs. The most delightful news is that young people; who will carry the future of Korea in the globalized world, are taking the lead in sharing their dreams and friendship with students in a global setting. They are achieving this goal by teaching others about Korea through various activities. Through exchange with people around the globe, Koreans gain more opportunities to introduce Korea naturally. In this way, they are also able to get to know things about Korea that they did not know before, and in turn begin to love Korea even more. With the help of VANK cyber diplomats, those who dream of becoming the main players in changing the image of Korea in our global society, people all over the world are now changing their perception of Korea. They are wondering more and more about Korea; a very small country which can only be seen if they look for it in the Pacific Ocean. People are now starting to look at Korean dictionaries to learn Korean language, even though they may not know anything about Kimchi. They even send letters to publishers requesting to change the title of the Sea of Japan in foreign text books to the correct title the East Sea. All this evidence shows us that Korea is growing in the hearts of people around the globe. Through the activities of the past 10 years, there was something VANK realized. 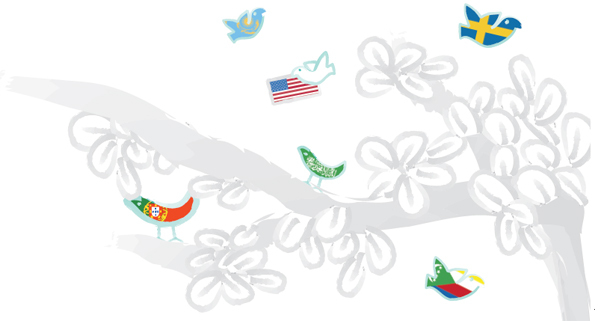 An ordinary student in elementary, middle or high school could become a diplomat representing Korea if they were presented with the right dream and vision. In fact, VANK’s members have their own special mission to create friends around the world and at the same time portray correct information about Korea. As representatives of Korea, these students are now creating the past, present and future of Korea. VANK cyber diplomats have expanded their territory by cultivating a vision. Now, after 10 years, VANK dreams of a new dream have appeared. Ten years ago, ordinary Korean netizens became cyber diplomats to change the image of Korea around the world. Now our wish is that they will become true world leaders who will listen to global issues more attentively and solve them more wisely to create a better world.